Splashtop New Features: March-April 2018 - Splashtop Inc.
iOS App: Updated Computer Management. New in version 2.7.4.0. Now when you click the info icon next to a computer on the list in the Splashtop iOS app, you will see a new information screen (shown in two columns below). It includes expanded information about the computer including the Account, Group, Streamer Version, IP Address, Last Session, and Current Status. The lower portion has an expanded list of options including Resolution, Clear Credentials, Delete Computer, Restart Streamer, Normal Reboot, and Safe-mode Reboot. 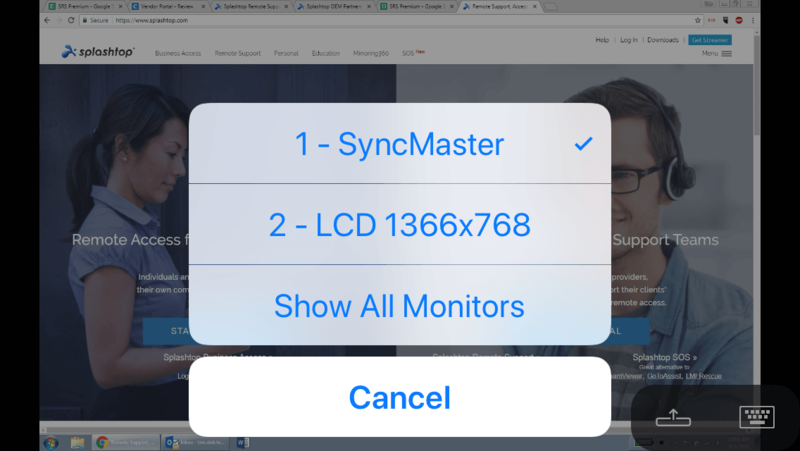 iOS App: Multi-Monitor Improvements with Show All Monitors – Previously you were able to view one monitor at a time in multi-monitor scenarios and switch between the monitors by tapping the switch monitor button. Now you can select a display by name or show multiple monitors on your iOS screen at the same time. When you select Show All Monitors, you see the screens side-by-side on your iOS device screen. They are two different sizes in this case because it is a large monitor next to a smaller laptop. iOS App: SOS Remote Session from iOS Device to iPad/iPhone and Android is now supported – Previously with Splashtop SOS on your iOS device, you could remotely view and control Windows and Mac computers. Now you can also remote view iOS and Android devices from iOS. You can also control some Android devices (rooted, Samsung, and some Lenovo and LG). Apple doesn’t allow remote control of iOS devices so it is remote view only. iOS App: iPhone X support – The iOS app has been redesigned for iPhone X and remote sessions can be maximized to full screen view now. 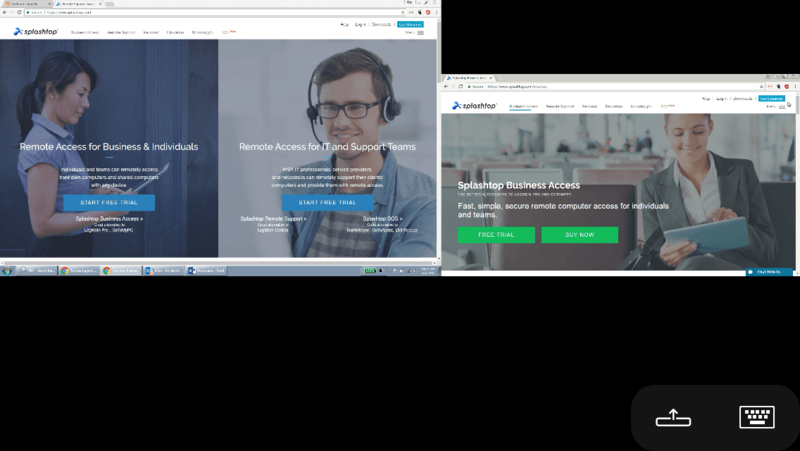 Beta Remote Support Premium features available for testing – We’re working on new features for the upcoming Splashtop Remote Support Premium package. If you would like to test the new features and give us feedback during the development process, learn more and sign up here.If you current have Splashtop Remote Support PLUS, the features can be activated in your product for free for the duration of the testing period. If you don’t have Remote Support PLUS, you can start a free trial and test the beta features in the trial. Both options require signing up on the form to get the beta features activated. Alerts and Windows update management features are currently available for testing. Get the latest bug fixes in the Splashtop Personal app version 2.7.4.6 for iOS on the App Store.